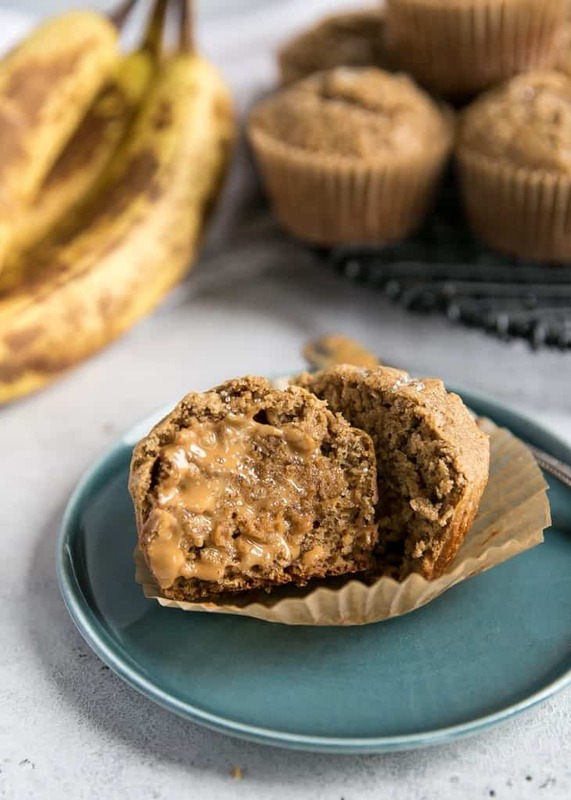 These healthy banana muffins are made with whole grain flour, sweetened with maple syrup, dairy free and gluten-free friendly using a 1-to-1 gluten-free baking flour. This post is sponsored in partnership with Bob’s Red Mill. As always, all opinions are my own. 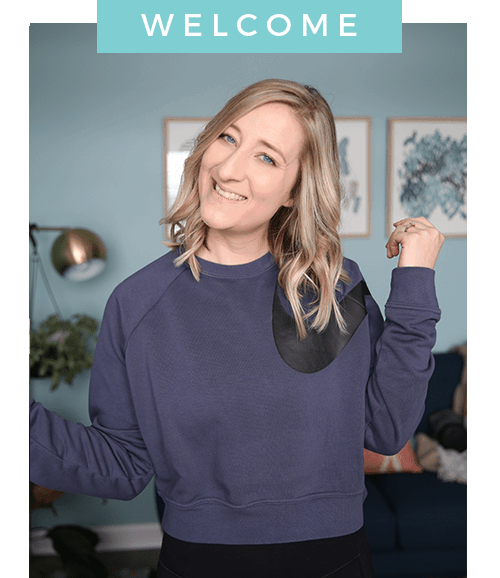 Thank you for supporting the brands that help me bring you new recipes! It’s unofficially (officially) BANANA BREAD WEEK on FMK. Note: I never actually say “yeehaw” it just sounds cool in my head writing. I am pretty excited about said “Banana Bread Week” because banana baked goods are my FAVORITE. Hopefully you like them too. I’m not sure what it is about baking with bananas… I didn’t even like fresh bananas growing up. It wasn’t until I studied abroad in Australia that I started eating bananas more regularly. 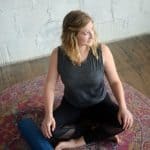 Anyways upon digging around here on the FMK site, I realized I am missing some of the traditional “go-to” banana bread or banana muffin recipes. I’ve got several paleo recipes <–– click here ––> but not a ton of the traditional whole grain muffins and breads that are, what I consider, a kitchen staple. 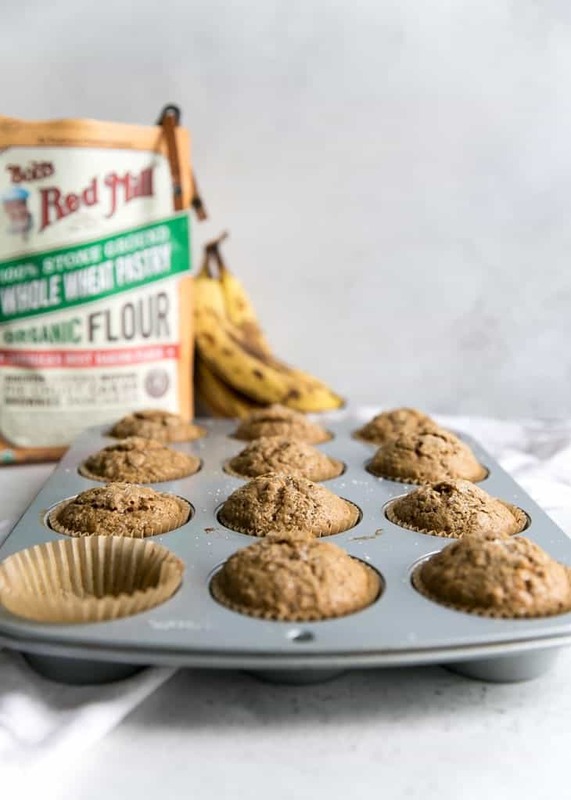 So I’m partnering with Bob’s Red Mill for these healthy banana muffins because everyone needs a great whole grain muffin recipe in their life. 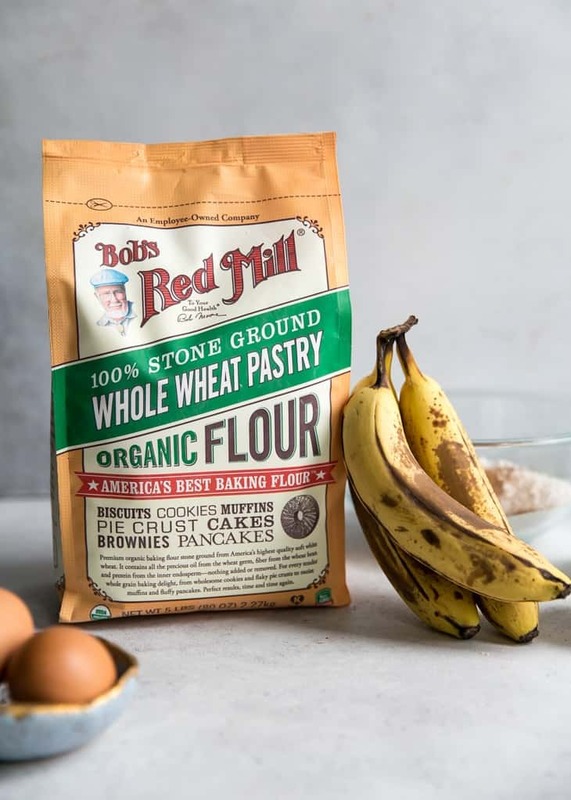 And Bob’s Red Mill makes the best flours for baking, including one of my favorites – whole wheat pastry flour. Whole wheat pastry flour is 100% stone ground from the finest soft white wheat. It has a lower protein content than whole wheat flour, making baked goods more tender. It’s really a great alternative to traditional all-purpose flour if you’re looking to add more whole grains to your diet. With recipes like muffins and quick breads, using whole wheat pastry flour yields a soft and fluffy recipe you’re looking for, without the dense texture you’d normally get from using whole wheat. If you’re looking for other flour alternatives, i.e. gluten-free, I touch on that more below. 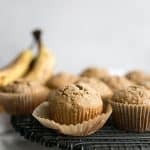 These banana muffins were tested several times and I’ve finally found the best ratio of ingredients. The cool thing about this recipe is that it’s actually quite forgiving. Meaning you can get away with a few minor adjustments if needed. For example this recipe can be made with applesauce or yogurt if you’re looking for an oil-free banana muffin recipe. 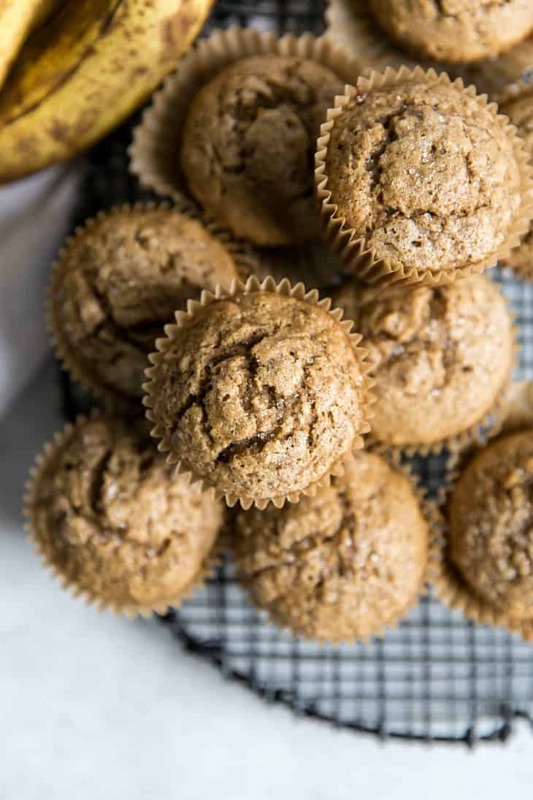 These banana muffins were actually adapted from my Whole Wheat Banana Bread, which is already dairy-free and oil-free. But with the numerous times I tested these banana muffins, the ingredients below is what yielded my favorite results. Soft, fluffy, flavorful and moist. FLOUR – Whole wheat pastry flour will yield the softest texture, but you can also sub half whole wheat, half all-purpose with similar results. If using whole wheat white flour or using Bob’s 1:1 gluten-free baking flour, I would use two tablespoons LESS. If looking for a grain-free alternative, see my simple paleo banana muffins or paleo banana bread. SWEETENER – The maple syrup here adds nice flavor and just a touch more sweetness. 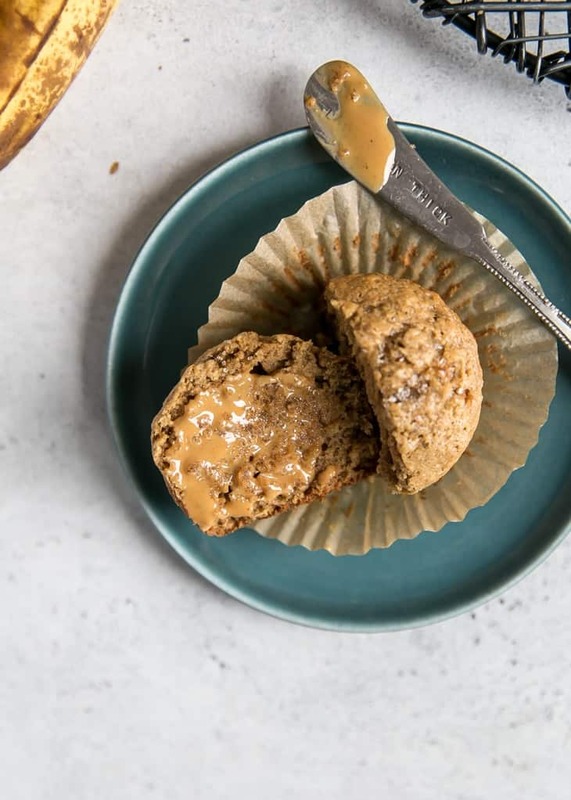 These banana muffins are not overly sweet, so if you think you want more you can add another 1/4 cup granulated sweetener – I would caution using more maple syrup or the rest of the ingredient ratios will be off. OIL – The oil keeps these banana muffins nice and tender. If you’d like, you can replace with applesauce or yogurt with similar results. You can also use more banana puree, but I think the texture won’t be as soft. 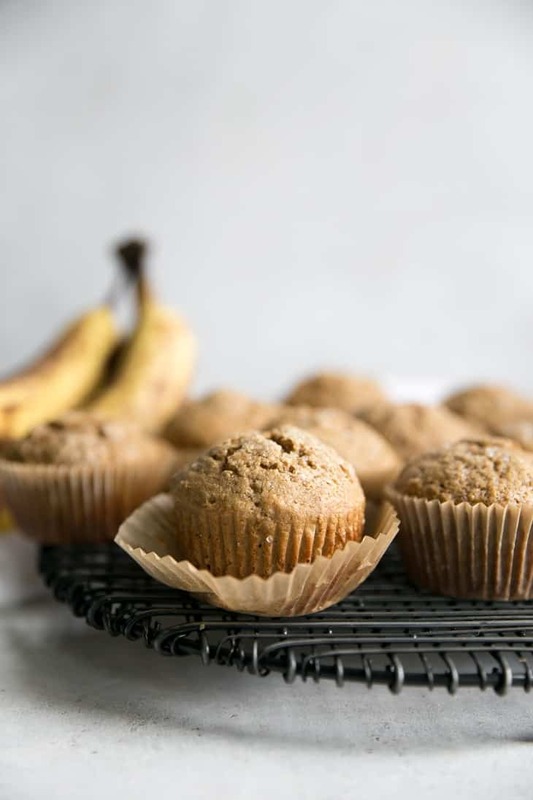 BANANAS – Make sure you use extra ripe bananas for the most flavorful banana muffins. The blacker, the better. You can use black frozen bananas just make sure they’re thawed out and you let some of the extra liquid come out of the peel before mashing. 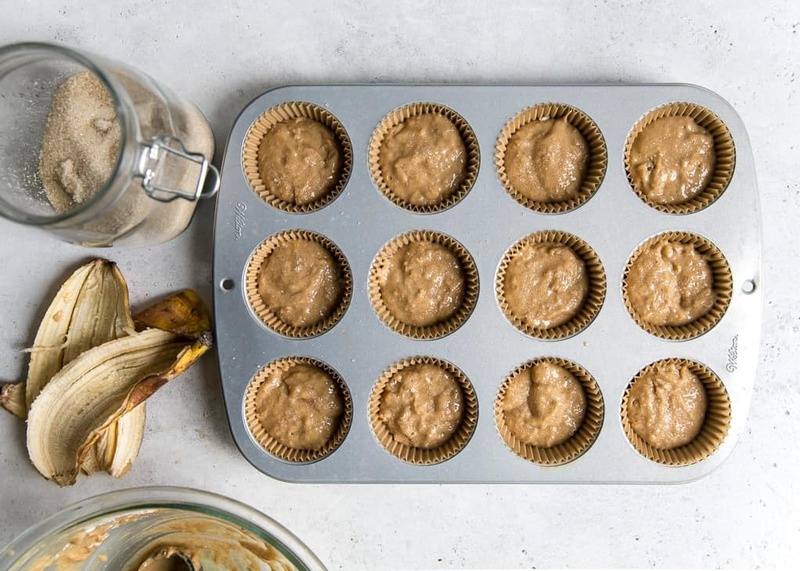 If you have barely spotty bananas and can’t wait to make these banana muffins, you can roast them in their peels at 375ºF for 30 minutes then allow them too cool before mashing. EGGS – I opted for eggs here but this recipe was also tested using flaxseed meal – just use two tablespoons of milled flaxseed mixed with 1/3 cup + 1 TBSP water and let sit until it gels. Then add the thickened mixture to the wet ingredients as normal. Baking Supplies – You just need a couple of bowls and a whisk, plus large spoon or spatula. 12-cup muffin pan, liners or spray oil. Dry Ingredients – I like to mix my dry ingredients separately to make sure the soda and spices get incorporated into the flour. Wet ingredients – Whisk together the (very well mashed) bananas with the maple syrup. Then add vanilla, eggs and oil and slowly stir in milk as you add the bowl of dry ingredients. BAKING TIP – Make sure you don’t over-mix the batter. The more you mix, the tougher the muffins will be. Use a medium cookie scoop to distribute for batter evenly into the muffin pan, filling about 2/3 way full. Sprinkle with coarse sugar for a sweeter top, throw in chocolate chips or even chopped walnuts. Don’t you wish you could smell them through your screen?! If you make this recipe, leave a comment and review in the comments below! I love hearing from you and it helps others find the recipe too! Preheat oven to 375ºF and line muffin pan with paper liners, or spray with oil; set aside. In a medium bowl whisk together dry ingredients; set aside. In large bowl combine well-mashed banana with maple syrup. Add eggs and oil, whisking until combined. Gently stir in vanilla and milk then slowly add in flour until just combined – careful not to over-mix or you’ll end up with tough muffins. Evenly distribute batter into prepared pan, filling about 2/3 way full. Bake muffins for 18-20 minutes, or until inserted toothpick in center comes out with no wet batter (some crumb is okay). Allow muffins to cool in pan for a few minutes before transferring to rack to cool completely. Muffins best enjoyed within 3 days, served warm with your favorite nut butter. Enjoy! OPTIONAL MIX-INS: Feel free to add 1/3 cup mini chocolate chips, chopped walnuts or pecans, and even more spices like 1/4 tsp ginger and nutmeg, additional cinnamon. FLOUR: Whole wheat pastry flour will yield the softest texture, but you can also sub half whole wheat, half all-purpose with similar results. If using whole wheat white flour or using Bob’s 1:1 gluten-free baking flour, I would use two tablespoons LESS. If looking for a grain-free alternative, see my simple paleo banana muffins or paleo banana bread. SUGAR: Taste-testers preferred with with additional granulated sugar. But if you don’t have a big sweet tooth, you can omit. If you use extra spotty, more black, bananas you may not need the granulated sugar. Maple syrup or honey is needed though – changing that will affect the rest of the ratios. VEGAN / EGG-FREE: To make vegan, use 2 TBSP flaxseed meal mixed with 6 TBSP water, let sit until it gels, about 4 minutes, then incorporate into the wet ingredients as directed. Store leftover muffins in airtight container at room temperature, or in fridge for a couple of days longer.